The first auction, M.U.S.C.L.E Figure Lot – 16 Various Figures – Rare Vintage Collectible Toys, features nothing interesting. It seems highly unlikely that even one collector would be interested in this lot. It has very little to offer. It’s the type of lot that should probably become target practice for a BB gun or get strapped to an explosive firecracker. It seems even less likely that there could be a figure in that lot that would help complete the UofM Figure Guide . The final price of the first auction will probably be $1.50 or maybe $2.00 – tops. The second auction, 1980’s Muscle Wrestling Neon Green Action Figure M.U.S.C.L.E., highlights one of the most interesting and unique parts of M.U.S.C.L.E. collecting – Counterfeit figures. 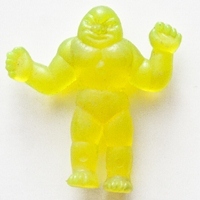 This translucent yellow figure is from the Future Strength brand of counterfeit figures. The Future Strength figures are one of the most recognizable Masquerading MUSCLE-type of figure. 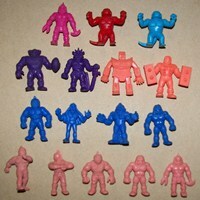 Masquerading MUSCLE’s are original vintage M.U.S.C.L.E.-like figures that are not direct copies of Kinnikuman/M.U.S.C.L.E. figures but clearly inspired by their similarity in style, texture, rigidity, color, and size. The final price of the second auction will be $6.50. The third auction, Kinnikuman SATAN CROSS kinkeshi figure M.U.S.C.L.E. 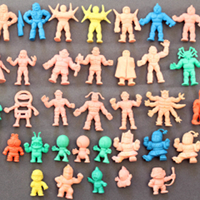 little rubber guys, and the fourth auction, Lot of 35 Kinnikuman kinkeshi figures from Japan M.U.S.C.L.E. 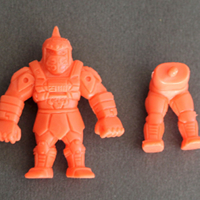 little rubber guys, come from one of the original M.U.S.C.L.E. and Kinnikuman collectors. Many collectors will already be aware of these two auctions, but the key thing for all collectors to understand is that this seller’s figures are always in incredibly great condition. Being completely unfamiliar with the current market price of Kinnikuman figures it is incredibly difficult to suggest any final prices. However, buyers should recognize that getting this pristine of figures from a seller in the United States is probably worth spending just a little bit extra to ensure an auction win. This entry was posted on Thursday, November 8th, 2012 and is filed under Art, Auction Watch, UofM News. You can follow any responses to this entry through RSS 2.0. You can skip to the end and leave a response. Pinging is currently not allowed. Chad will you be going after the purple 157? No. I figured it would be sold at a just plain silly price, so it never really went on my radar.